The Crusader army of Simon IV de Montfort defeated the Aragonese and Catalan forces of King Peter II of Aragon, who had come to the aid of the Occitan forces of his vassal Raymond VI, Count of Toulouse. 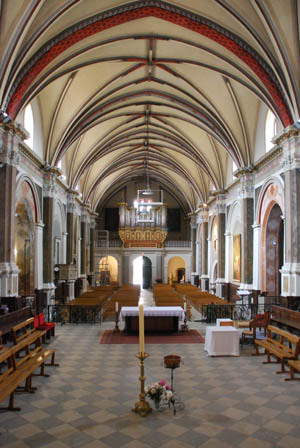 Muret is a commune in the Haute-Garonne department in south-western France. 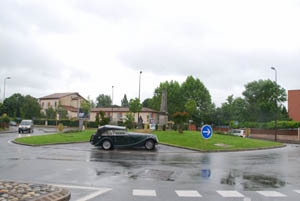 Today It is an outer suburb of the city of Toulouse, though it does not belong to Greater Toulouse, which it declined to join. 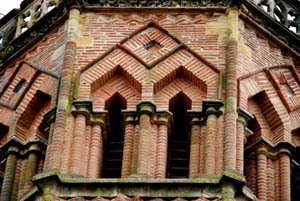 It lies Southwest of Toulouse and is the largest component of the intercommunality of Muretain. Today there is no vestige of the Medieval castle there, and the battlefield has been largely built over. The Battle took place outside the castrum of Muret, now the centre of of much larger town, so much of the battlefield lies below modern housing. 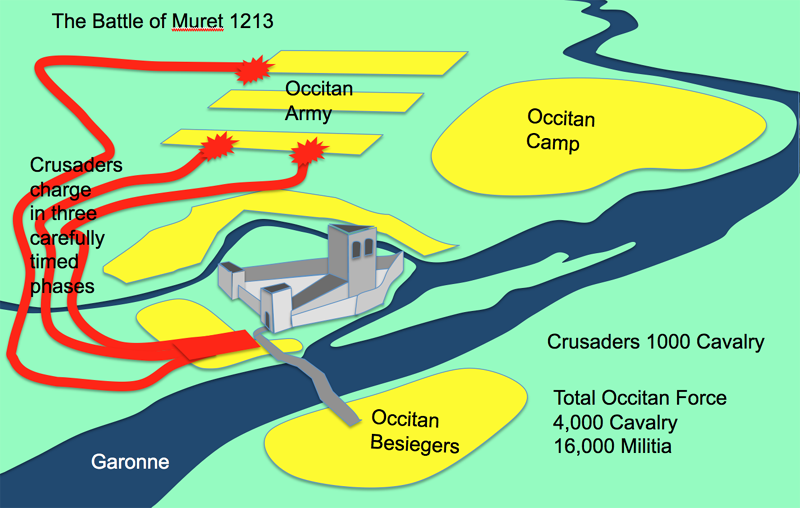 By September 1213, the town of Muret was back in the hands of the Occitan lords. About 30 crusader knights remained within the castle. They knew they could not resist for long. They sent a message to Simon de Montfort who was at Fanjeaux to come to their rescue. 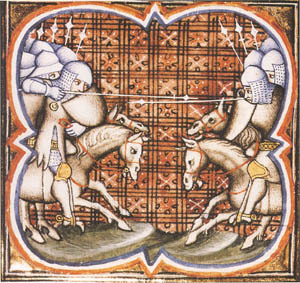 Simon assembled as many knights as possible among the crusaders who had not yet gone back to France after their 40 days of annual duty and they rode hotfoot to Muret. The king of Aragon ordered his men to withdraw from the town to allow Simon's troop to enter the citadel (planning to trap them there). The following day, Simon launched a sudden attack. 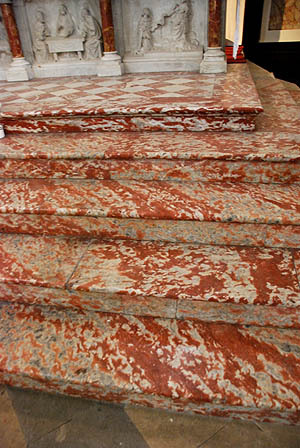 The Meridionals were not well organised. 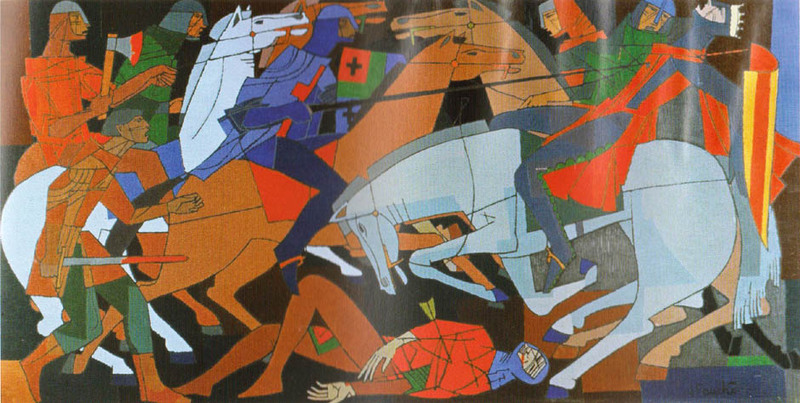 Together with thousands Catalans, Aragonese and Occitans, the king of Aragon died in the field of battle. Simon's victory was complete. 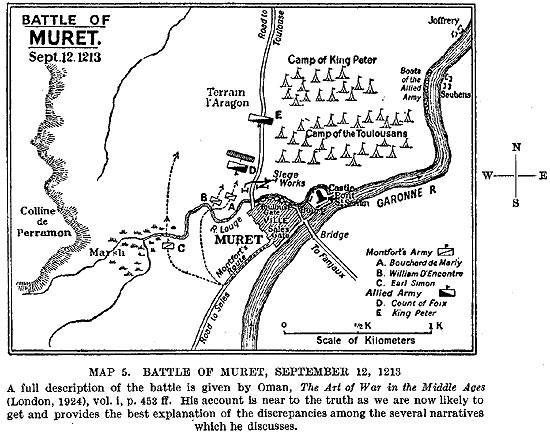 Cavalry : about 900 knights and sergeants, split into 3 battles of 300 men each. 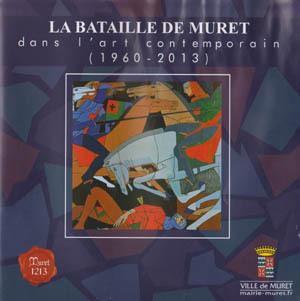 1st squadron: (vanguard) : Guillaume de Contres and Guillaume des Barres. Infantry: about 700 crossbowmen and spearmen defending the castle and protecting the access for the cavalry. Cavalry: about 2,200 knights and sergeants. 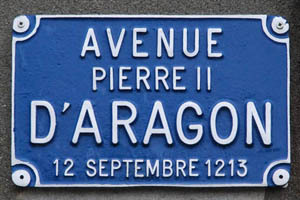 1st group: about 200 Aragonese plus 400 men under the Count of Foix. 2nd group: about 700 Aragonese led by the King of Aragon. 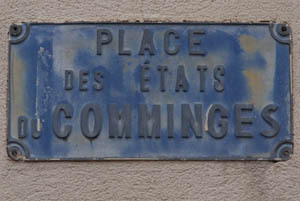 3rd group: about 900 men led by the Counts of Toulouse and Comminges. They were probably not fully prepared, possibly not yet mounted. Infantry: less than 10,000 men. 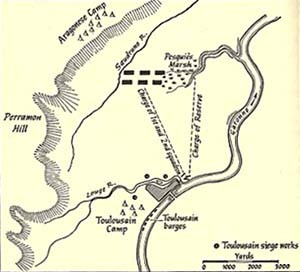 Some attacked the castle, others stayed encamped or followed the cavalry. 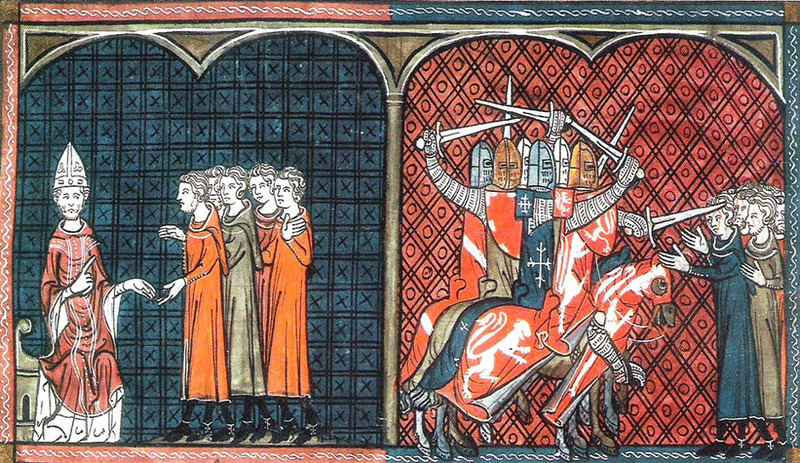 Simon de Montfort's 870 mailed cavalry included 270 knights, making the small force of exceptional quality. 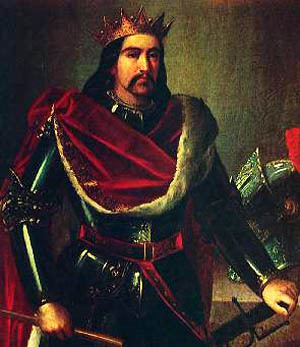 King Peter of Aragon had brought 800 to 1,000 Aragonese cavalry, joined by a militia from Toulouse and allied armies brought by the Counts of Comminges and Foix. King Peter of Aragon's combined forces possibly numbered 4,000 cavalry, with thirty to forty thousand infantry. 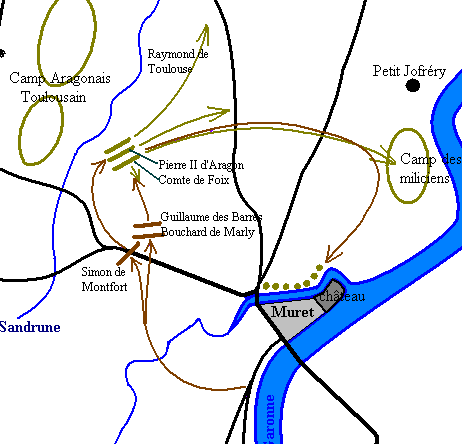 Montfort divided his army into three squadrons, and then led them across the Garonne to meet the Aragonese forces. Raymond, advised a defensive posture in order to weaken the advancing enemy with bowshot and javelins. Peter rejected this suggestion as unknightly and dishonourable. Peter rode to the front line, forsaking his royal armour for the plain armour of an ordinary knight (a common practice for fighting kings of the time), an ordinary knight donning the king's armour. 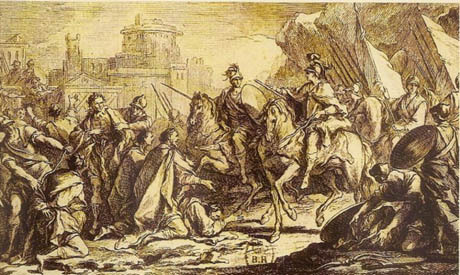 When de Montfort's first squadron charged the field, the Aragonese cavalry was crushed and Peter himself was unhorsed. He is reported to have cried out, "I am the king!" but it is not clear why - according to one account he was embarrassed by the poor fighting ability of the knight wearing the royal armour. According to another report he was expecting to be taken prisoner rather than be killed. In any case he was killed. 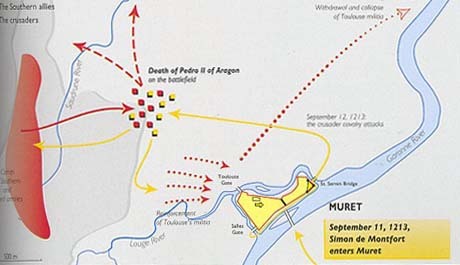 With the realisation that their king had been killed, the Aragonese forces broke in panic and fled, pursued by Montfort's Crusaders. 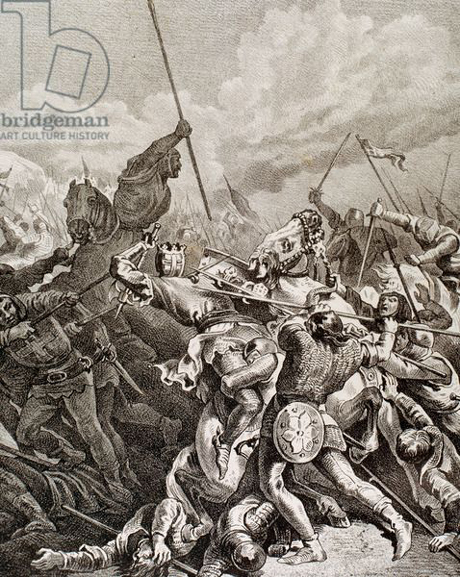 According to the Crusader chroniclers the coalition army numbered almost 34 000 men and de Montfort's army only 2,100, but it seems likely that the imbalance has been exaggerated - as it almost always was by the victorious side in medieval battles. This was one of the very few open battles of the Cathar Wars - the local forces must have known that they were no match for Simon's army. Simon was a brilliant military strategist, tactician and leader, commanding a highly organised aggressive and experienced hierarchical army. The local forces were poorly organised, uncoordinated and more concerned with paratge, cortezia and convivienza than military victory. 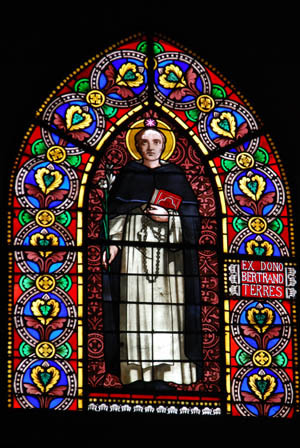 Peter must have known that the tactics of the Count of Toulouse would have ensured victory, but imagined that God would ensure victory (the same mistake that Simon would make at Toulouse five years later). 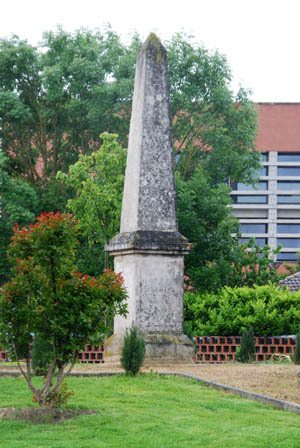 A monument to Peter II marked the spot where tradition holds that he fell in battle near the modern tourist office. 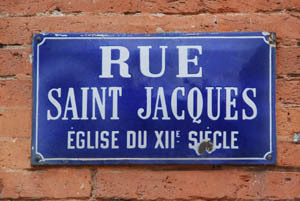 Shamefully, a modern French highway has been build over it - the French are not keen on reminders that they annexed this territory after killing the suzerain of these lands in defeating the House of Toulouse. 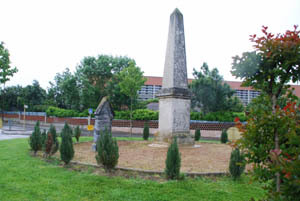 The monument has been moved to a spot nearby, on a traffic roundabout. 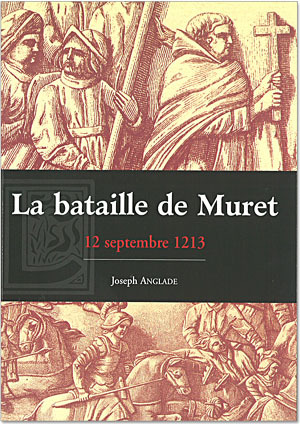 "... bed ni centenari dera batalho de Muret en Pedro Aralounes Catala le Gadouoas cayown pera a defenso debas libertas ded... 1213,"
.. in commemoration of the battle of Muret and Pedro of Aragon "The Catholic" who died defending our liberty 1213." 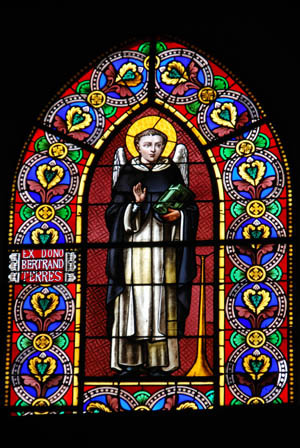 There is another reminder of the battle, as Dominic Guzmán, now St Dominic was there. 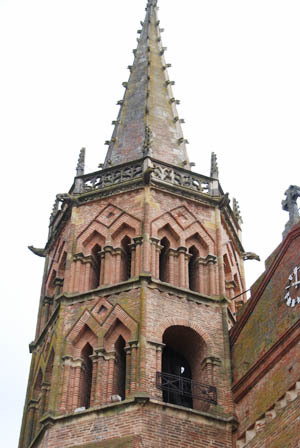 Churchmen like Dominic and Arnaud Amaury played a prominent role in military sieges - Senior churchmen were often the chief engineers for siege engines, and Arnaud had been supreme commander of the Crusade in the early days. But less warlike senior churchmen would generally retire from open battles. 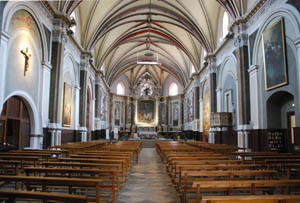 St. Dominic de réciter et précher La Rosaire. 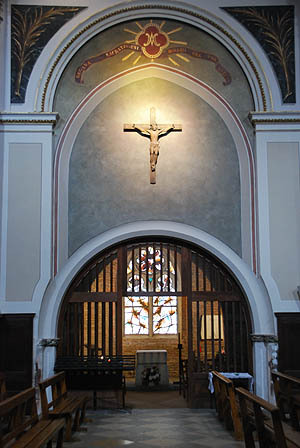 St Dominic to recite and preach the Rosary. 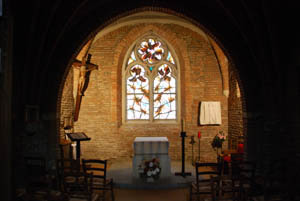 Saint Dominic chapel in the Eglise St Jacques in Muret. 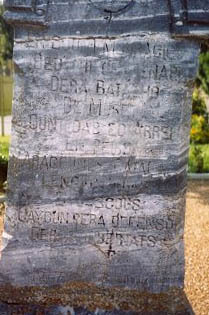 En conmemoración del VII centenario de la batalla de Muret, en donde el rey Pedro, aragoneses, catalanes, lenguadocianos y gascones cayeron en defensa de las Libertades. 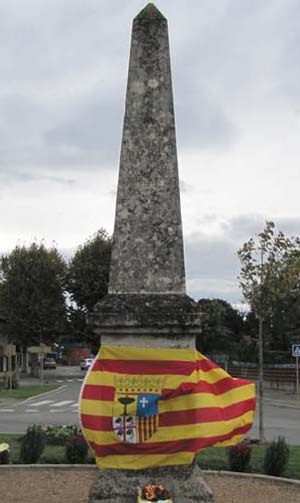 Dedicado el 12 de septiembre de 1213 - 1913"
In the VII Centenary Commemorations of the Battle of Muret, where in the King Pedro of Aragon, Catalan and Gasconlenguadocianos fought in defense of liberty. 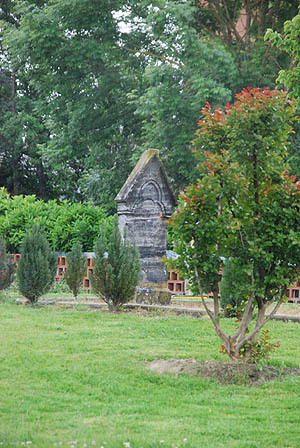 Dedicated September 12, 1213 - 1913 "
The two memorials have been moved to a traffic roundabout! 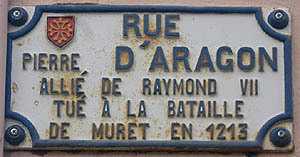 A reminder that Muret was the gateway to the territories of the Count of Comminges, ally of Raymond, Count of Toulouse and Peter, King of Aragon. 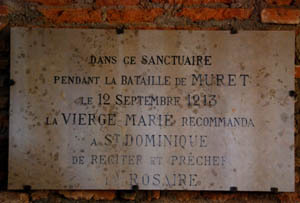 Memorial plaque in the Eglise St Jacques in Muret. 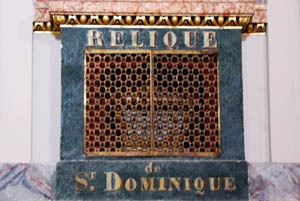 Relics of Saint Dominic, Eglise St Jacques in Muret. 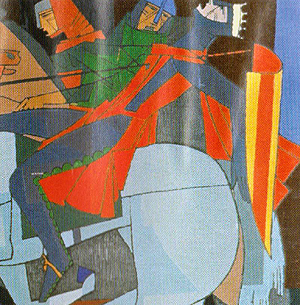 Peter is shown on the right, being run-through by a knight's lance. 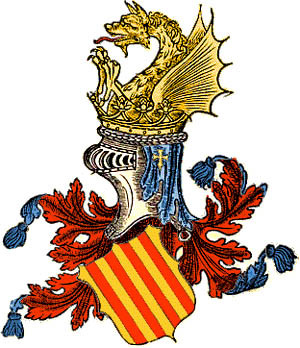 He is (incorrectly) shown wearing his royal crown and bearing the arms of Aragon. 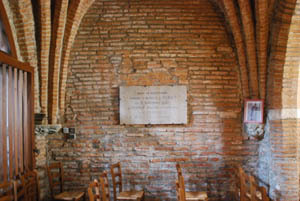 The death of King Peter II is still remembered in Aragon. 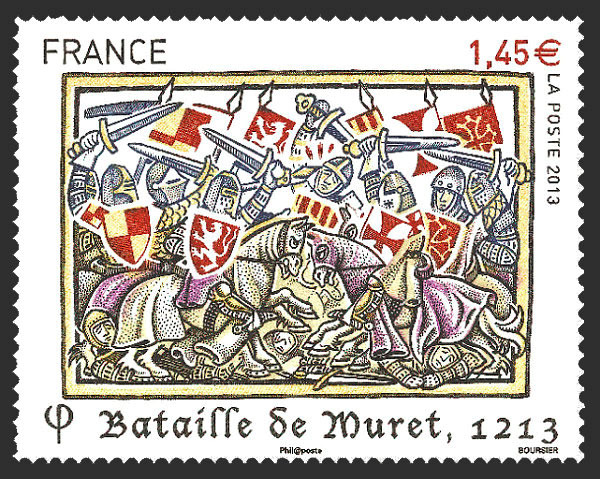 A French stamp commemorating the battle of Muret on the 800th anniversary. Unusually, the heraldry is accurate. 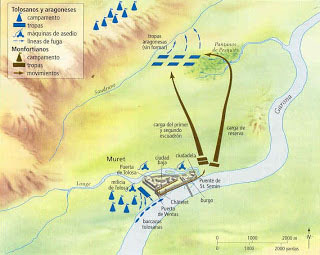 The exact location of events during the battle is disputed. 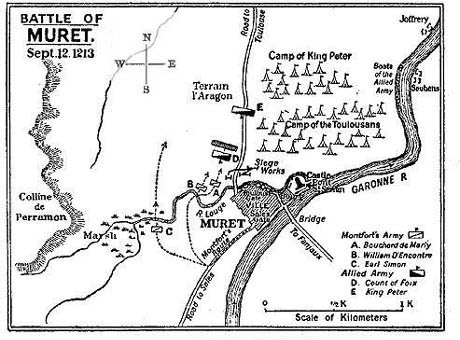 Below are a number of alternative maps illustrating the battle. We have tried to credit the authors wherever possible, but not all are known. If you are able to provide further information, please contact the webmaster. 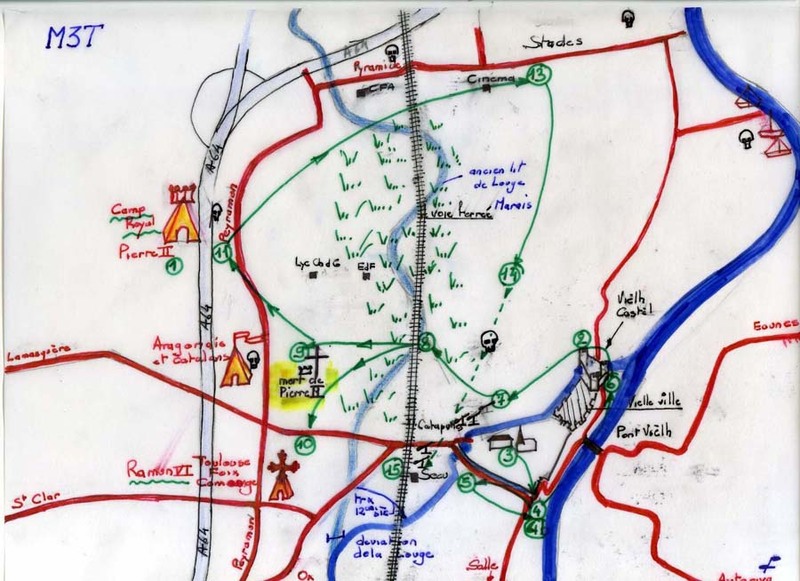 Schematic from http://ximene.net/home/research-topics/history/genocide-in-occitan/the-albigensian-crusade/#/ by Brian Charles Lilley ? 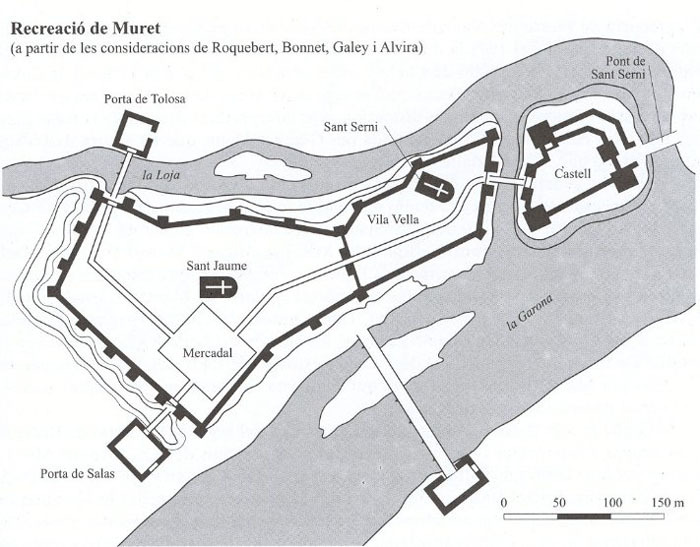 Plano de Muret en 1213, obra de F. X. Hernández.